An engaging storyline. A strong heroine. A complicated future. 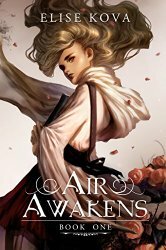 Air Awakens is the first in the Air Awakens series by Elise Kova. SUMMARY (from back): A library apprentice, a sorcerer prince, and an unbreakable magic bond… The Solaris Empire is one conquest away from uniting the continent, and the rare elemental magic sleeping in seventeen-year-old library apprentice Vhalla Yarl could shift the tides of war. WHAT I THOUGHT: To the commoner, magic is a misunderstood and scary phenomenon. To those gifted with it, it’s a weapon to be wielded. From the four corners of the kingdom, different magical affinities originate: Firebearers from the West, Waterrunners from the South, and Groundbreakers from the North. But what of the East? For more than a century a societal prejudice has existed against Windwalkers, magicians from the East. For something happened that had the race exterminated. While hints are offered as to why, there’s much more to understand as we meet Vhalla Yarl, a commoner who works in the royal library. Impossibly and unbeknownst to her, she is a Windwalker and her powers are about to be manifest despite her efforts to deny them. Imagine yourself holding to cultural narratives that magic is ‘bad’ just to find it is part of you. But confront it she must. Aldrick, the eldest Prince of the kingdom (a powerful Firebearer in his own right), deduces her affinity when she saves him from a mortal wound when he is injured in battle–her research produces the cure the Royal healers are unaware of, as well as a magical Bond between them that begins to heat up in a forbidden relationship. Through Vhalla’s trials, we see her emerge as the strong heroine she is as she grapples with the choice before her to embrace her Affinty and begin a new and unfamiliar future, or have it removed and follow a familiar and comfortable path. As you would imagine, forces are at work to prevent the latter, not the least of which is a trial at the hands of the Senate over her actions that threatened the prince. All that said, a professional editor should have gotten hold of this work before it hit the shelves. I found numerous missing words, words used incorrectly and the like that a professional set of eyes would have quickly fixed. It just drives me crazy when such a good work is compromised for such a simple thing. As a reader, I don’t want to think about the mechanics. I want to get lost in the story. I would have given this 5 stars but for that, for which I deduct 10% and give this 4.5 stars. Despite the poor editing issue, the engaging storyline had me preorder the second book in the series that is scheduled to be released Nov 19, 2015. FREE EBOOKS: I also invite you to download the free ebooks of thePrequel and the award winning Book one in the Andy Smithson epic fantasy series. Would you consider leaving a review on Amazon after you read them? Thanks so much! This sounds like a very fun read. Adding it to my TBR! Thank you for addressing the editing issue! I thought that I was the only one that noticed. I enjoyed the book (very, very, very much), but I ended up treating the editing mistakes as a sequence of language native to Kova’s book. Loved the review! Sounds like my kind of thing, I’ll definitely be checking it out! I get really annoyed by typos and errors (I do a lot of proofreading in my day job) so I hope I don’t end up throwing the book across the room. Great review, sounds like another for my tbr pile! I love anything magic, elemental, YA-esque so this sounds perfect, although I proofreading is a big part of my job, so I hope the typos don’t make me throw the book at the wall!